Just east of US 160, in the San Juan River floodplain. Here, after 329 miles chaining east to west from Oklahoma, Arthur D. Kidder was closing in on Four Corners, just about to complete the replication of Ehud Darling’s sloppy 1868 survey. Kidder wouldn’t get paid for his work for decades; Kidder’s survey, initiated in 1925, was finally published by the US Supreme Court in 1960, two years after Kidder’s death. View west, toward Four Corners. View east. The San Juan River provides irrigation from the Continental Divide to the Colorado River. 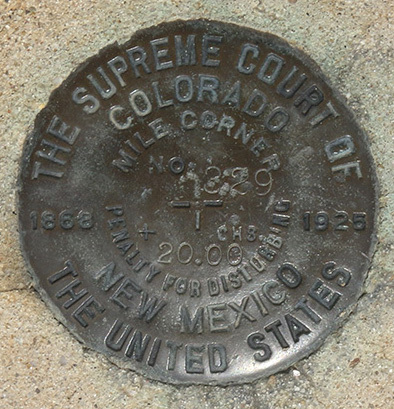 Surveyor’s monument located at N 360 59.9306′ W 1090 1.9465′, elevation 4635 ft.